Lorne will be filming for the new tv series “Arctic Air” so won’t be able to host the Oct 13 Dreamcatcher event but will be there in spirit as Lorne and Monique Hurteau will once again be co-writing the script for the gala and awards event. Do check it out! 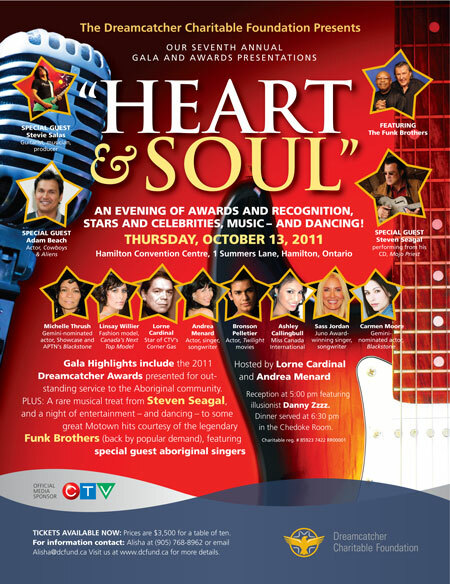 Lorne Cardinal Wes Studi and Andrea Menard will co-host another fantastic Dreamcatcher Gala in Hamilton, ON on Oct 13, 2011. Special guests include: THE FUNK BROTHERS & STEVEN SEAGAL!!! Ticket info at www.dcfund.ca & click here for poster. This entry was posted in All, Appearances and tagged Andrea Menard, Bronson Pelletier, Dreamcatcher, Dreamcatcher Foundation, Dreamcatcher Gala, Hamilton Ontario, Mojo Priest, Motown, Sass Jordan, Steven Seagal, The Funk Brothers. Bookmark the permalink.